April | 2007 | TGIM Work-Life! What’s with all the ‘life’ these days? In the last two weeks, at least two major Canadian newspapers have launched significantly more robust life sections. The National Post and the Globe and Mail have each buffed up their life sections to include pages upon pages of articles on all kinds of issues — including work-life. Notice how work is no longer separate from life. It all goes together. Media doesn’t invest in extra pages of content unless they know its of interest to their constituents (readers and advertisers). This isn’t benevolent editorial. It’s about business and these days work-life is a competitive advantage! Not just in the papers, but in the workplace too. “Work-life balance has become a new competitor for top talent,” said Allision Cheston, chief marketing officer of New York-based Association of executive Search Consultants (as reported by the Globe and Mail). The key take-away for me is that this interest in work-life is not just a fad; not just a fluffy pre-occupation. It’s serious business. It’s not going away so fast. I should start a blog on this! Hope you are enjoying it. Have (and make) a super Monday! He shares his experience in shifting his approach wrt to his weekly Toronto visits. Whereas he used to jam-pack his time in Toronto (he’s based in Ottawa) with back-to-back formal meetings that ‘pushed the agenda’ with lots of decision-making focus, he’s learned that those visits used to stress out his people. Now he takes a more informal, open approach and devotes more time to learning about his people and simply ‘tuning in’. He conveys the value of being there for the brown bag lunch get-togethers, some water cooler chat and informal drop-in meetings to help him understand what’s really important to his people – in their work and in their lives. Invaluable and so much more powerful than simply only focusing on task and strategy conversations. Please read it for yourself. Joe’s post demonstrates the thinking of a reflective leader who understands the value of building relationships internally and seeing employees as way more than their functional roles. He gets that his people have lives in and out of the office. So to leaders and aspiring leaders, ask yourself this Monday morning: What does ‘being there’ look like to you in your work life? And how will you be there for your people this week? Thanks Joe – great inspiration for the start of the work-week! A life of leisure and pleasure might sound good when you’re under the gun, stressed and pressured with all the demands of work and life. But too much easy liv’n may not be as gratifying as you think. Don’t take my word for it. Take Martin Seligman’s word (author of Authentic Happiness and founder of the positive psychology movement). He makes a very explicit distinction between “pleasure” and “gratification’. While both have a place in the ‘the good life’, they have different roles. The former is the stuff in life that we enjoy but doesn’t necessarily require ‘work’ or effort. E.g. eating bon bons (or other yummies), hammock naps, passive TV watching, etc. All good for you in the right doses — but not necessarily what in themselves lead to a gratifying life (work included). Easy street is nice for a bit but gratification — in work and life — comes when we employ our Signature Strengths. We each have our own unique list of Signature Strengths and the idea is to use them as often as possible in our work and daily lives. Don’t take my word for it (or shall I say Martin Seligman’s word) — Just ask the Lizard! In his book, Seligman tells a story of one of his teachers (Julian Jaynes) who got an exotic lizard as a little pet to have at the office. Upon arrival, that darn lizard wouldn’t eat — no matter what he was fed. The poor lizard seemed depressed and was withering away. That is until one happy accident a couple weeks later — Julian mindlessly placed a newspaper over the sandwich that was meant to be the lizard’s lunch (but had been ignored by the lizard as with all other food offered). Within seconds , the lizard started to shred up the newspaper and made its way to the sandwich and gobbled it up. Go figure! The lizard needed to work….to express its own instinctual signature strengths…which in this case, was shredding. Once he gratified that need, his appetite came back. This happens with us ‘non-lizard’ types (people!). We need to exercise our Signature Strengths to experience gratification. It’s what leads to a meaningful life (and work-life). So think about your own situation. Do you know what your Signature Strengths are? If not, find by taking the Via Signature Strengths online assessment. What energy and inspiration do you feel when you do something that engages some of your strengths? What happens when you don’t engage these strengths – ever get that lethargic, stuck-in-the mud kind of feeling….? How can you start engaging more of your strengths right away – at work and elsewhere in your life? Now if you’ll s’cuse me – this writing has made me hungry. Having worked some of my strengths – I’m feeling a bit more ‘gratified’ and am ready for some pleasure….it is lunchtime afterall and Seligman says we need both pleasure and gratification for our ‘good life’. Next Big Leadership Development Trend: Horsing around…. I can’t believe I spent all that time, effort and $ to become certified in coaching and, more recently, the EQ-i system (emotional intelligence)! When instead, I could’ve/shoud’ve been taking horseback riding lessons! That’s right – I just found out that the latest leadership development trend is — get this: horseback riding. Yuppers – heard it with my own two ears this morning on CBC Radio – a Metro Morning news story. Apparantly, there’s a company in Alberta (sorry, missed the name) that sent its leadership team out to the barn to learn how to more effectively communicate with horses. Guess, they figure if you can teach a horse to trot, cantor and gallup – well, all the more possibilities with your own team back at the ranch…..er, I mean office. TGIM! 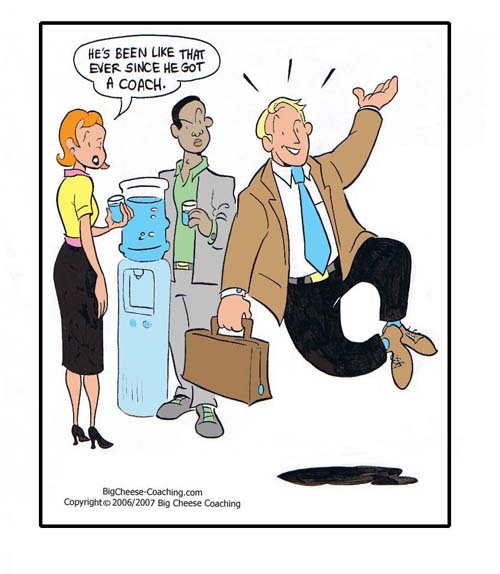 With a little plug for coaching! Oh and Kudos to Dalton Sharp – a fab cartoonist. More to come another time. Do you know your Signature Strengths? Great leadership (at all levels) starts with knowing yourself. Know what is important to you; what you stand for; what your values, passions and strengths are -and of course, know what your challenges and gaps are. Of course all this must align with the bigger picture of organizational/team/group context. But if you don’t know yourself – it’s more challenging to be an effective, inspiring leader of others. Self awareness is a very big part of emotional intelligence. There’s lots to know and it’s a lifelong journey…one that evolves, unfolds as you grow and experience life. A great tool to explore your strengths is the Via Signature Strengths developed by Martin Seligman, author of Authentic Happiness and founder of positive psychology. If you haven’t already discovered this great tool – go to the Authentic Happiness site and find the Via Signature Strengths test. It will give you a ranking of 24 strengths. You’ll want to be paying particularly close attention to those that rank in the top 5 or so. The idea is to work, live and play to your strengths as often as you can. This leads to more success and fulfillment. More on this later…but for now, I say Monday morning is just a few hours away. Do yourself a favour and start the week by ‘remembering who you are’ from a place of strength. Enjoy and here’s to a great start to a TGIM work week!